The phenomenon of altruism extends from the biological realm to the human socio-cultural realm. This paper sketches a coherent outline of multiple types of altruism of progressively increasing scope that span these two realms and are grounded in an ever-expanding sense of"self." Discussion of this framework notes difficulties associated with altruisms at different levels. It links scientific ideas about the evolution of cooperation and about hierarchical order to perennial philosophical and religious concerns. It offers a conceptual background for inquiry into societal challenges that call for altruistic behavior, especially the challenge of environmental and social sustainability. 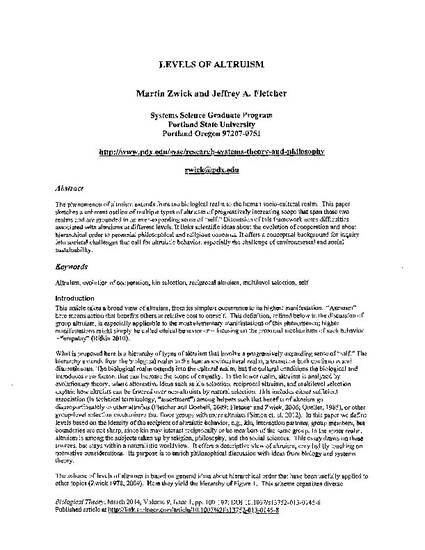 An earlier version of this paper was presented at the 63rd Annual Northwest Philosophy Conference, Lewis and Clark, Nov 4-5, 2011, and may be found at http://archives.pdx.edu/ds/psu/16574. Zwick, Martin, and Jeffrey A. Fletcher. "Levels of altruism." Biological Theory 9.1 (2014): 100-107.